The war in Europe ended on May 7, 1945 when German representatives signed the surrender document in Reims, France (see Germany Surrenders). Germany was in ruins. Most of her cities reduced to rubble, her transportation system in shambles, her countryside strewn with an estimated 5.2 million wandering Displaced Persons. 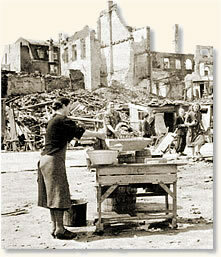 An estimated 20 million Germans were homeless. "White flags were hanging out of windows..."
In the closing days of the war, Charles Lindbergh was dispatched to Germany to gather information on the new aircraft the German Luftwaffe had developed such as the jet fighter and the rocket plane. He arrived in Germany just days after its surrender and roamed the countryside looking for information. He kept a journal of of his experience that provides us a glimpse of a nation that had aspired to conquer the world but was pulverized into defeat. White flags were hanging out of windows in villages we passed on the way, just as they had been hanging out of many of the windows in Munich. At one point we stopped to ask directions from a group of young German soldiers - in uniform but disarmed and apparently plodding along on their way home - a half-dozen young men, courteous, giving us directions as best they could, -showing no trace of hatred or resentment, or of being whipped in battle. They looked like farmers' sons. The winding, stone-paved road up the mountain�side to Hitler's headquarters was filled with American military vehicles - jeeps and trucks filled with soldiers, WACS, and Army nurses, apparently bent on seeing where der Fuhrer had lived and operated. We parked our jeep at the side of the building and climbed up over rubble to a gaping doorway. A few yards up the road I watched a German officer (in charge of the soldiers cleaning up) salute an American officer who passed nearby, bowing his head slightly as he did so. The American officer sauntered by, obviously taking no notice whatever, although the German held the salute until he had passed. I shall never forget the expressions of those two men. Most of the walls of the building, being thickly built of stone, were standing firmly. Inside, rubble covered the floors, and part of the wooden furnishings had burned. We made our way over the debris on the floor of the room said to be Hitler's office to the great oblong gap which was once filled with a plate-glass window. It framed almost perfectly a high Alpine range - sharp crags, white fields of snow, saw-tooth peaks against a blue sky, sunlight on the boulders, a storm forming up the valley. It was one of the most beautiful mountain locations I have ever seen. ...We made our way back into the rear chamber. There was the stench of the dead-bodies somewhere only partly buried. We climbed up the mortar-strewn stairs, the end open to the sky where the roof had been blown off. Down again and to the kitchen, edging past a line of doughboys coming in, rifles over shoulders. The floor was covered with twisted utensils and broken dishes; the stoves, with rubble thrown up by the bombs and fallen down from the ceiling." "There was no hostility in her eyes..."
"As we approached Zell-am-See we entered territory still ruled by the German Army. Officers and soldiers were still armed and still directing what little traffic passed over the roads. Groups of soldiers stared at us as we passed but made no gesture. I could detect neither friendship nor hostility. In every instance where we asked directions, they responded with courtesy. The two of us in an American jeep drove through divisions of the Germany Army as though there had been no war. As I carried my barracks bag in through the door I met a young German woman carrying her belongings out. There was no hostility in her eyes as they met mine, simply sadness and acceptance. Behind her were three children, two little girls and a little boy, all less than ten years old. They stole glances at me, angry and a little frightened, like children who had been unfairly punished. Their arms were full of childhood belongings or light articles they were carrying out to help their mother." This eyewitness account appears in: Lindbergh, Charles, A., The Wartime Journals of Charles A. Lindbergh (1970); Ziemke, Earl F., The U.S. Army in the Occupation of Germany 1944-1946 (1975). 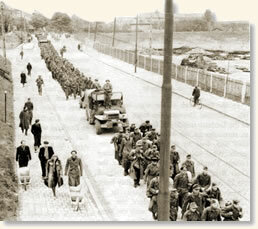 "Germany in Defeat, 1945," EyeWitness to History, www.eyewitnesstohistory.com (2006).